Habit: Annual; hairs simple, or stalked-forked. Stem: prostrate to erect, branched at least distally. Leaf: basal not rosetted; proximal cauline deeply pinnately lobed, lateral lobes entire to dentate or lobed; distal short-petioled to sessile, less divided, not basally lobed. Inflorescence: bracted. Flower: sepals oblong, erect to ascending, base not sac-like; petals obovate to oblanceolate or spoon-shaped, yellow or occasionally tinged purple, short-clawed. Fruit: silique, linear to oblong, or obconic silicle, dehiscent, unsegmented, flat perpendicular to septum (or septum 0); valves 2 or 4. Seed: 4--70, 1 or 4 rows per chamber; wing 0. Stem: (0.4)1--4.5(6) dm. Leaf: blade (1.5)2.5--10(15) cm; lateral lobes entire to dentate or pinnately lobed, pairs 3--8(12). Flower: sepals 2.5--4 mm; petals 3--6 mm, 1.5--4 mm wide, yellow, occasionally tinged purple. Fruit: silique, linear, (2.5)3--6(7) cm, 1.5--2(3) mm wide, length 13--46 × > width; valves 2; style (0.3)0.5--2.5(4) mm; pedicels erect to ascending, (4)6--17(35) mm. Seed: 30--70, 1.2--1.6 mm, oblong. Chromosomes: 2n=16. Synonyms: Tropidocarpum gracile var. dubium (Davidson) Jeps. 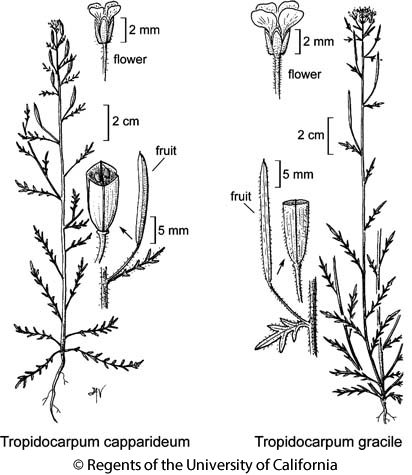 Citation for this treatment: Ihsan A. Al-Shehbaz 2012, Tropidocarpum gracile, in Jepson Flora Project (eds.) Jepson eFlora, http://ucjeps.berkeley.edu/eflora/eflora_display.php?tid=47412, accessed on April 22, 2019.
s NCoRO, NCoRI, CaRF, SNF, Teh, GV, CW, SW, w DMoj; Markers link to CCH specimen records. Yellow markers indicate records that may provide evidence for eFlora range revision or may have georeferencing or identification issues. Purple markers indicate specimens collected from a garden, greenhouse, or other non-wild location.